Cathy Vecsey and HL Sanction. September 21, 2016 – New York, NY – The third annual Rolex Central Park Horse Show (RCPHS) began on Wednesday evening, September 21, in New York City’s Wollman Rink with featured competition celebrating the Arabian breed. The Arabian Horse Association (AHA) and Aljassimya Farm proudly presented the second annual Arabian U.S. Open at RCPHS, showcasing the beauty, athleticism, and diversity of the Arabian breed through a variety of classes. A mix of in-hand/halter and performance classes graced Wollman Rink Wednesday evening, as the Arabian horses kicked off opening night in Central Park. To start, the Arabian Mounted Native Costume class portrayed the magic and romance of the Arabian horse as ancestors of modern day light breeds. The performance division also included classes in Hunter Pleasure Pro/Am, Western Pleasure Pro/Am, and Country English Pleasure Pro/AM. Junior Mares, Junior Stallions, Senior Mares, and Senior Stallions were then presented in-hand to highlight the horses as desirable breeding stock based on their conformation and shape. Gold, Silver, and Bronze Champions were awarded for each of the classes offered. The gold medal winner of the Mounted Native Costume class for the second year in a row was HL Sanction, owned by Hawk Haven Farms and exhibited by Cathy Vecsey. At an incredible 27 years of age, the beautiful Arabian, bred by Jayne Solberg, displayed the bloodlines of sire The Chief Justice and dam Overlook Seratifa. The silver medal was awarded to Captain Courageous PA, owned by Madison Fernandes and Krystal Duarte, and exhibited by Kayleigh Meyer. This year, performance classes were ridden Pro/Am style, with the exception of the Mounted Native Costume class. Pro/Am allows professional horsemen and women to ride the horses the first direction of the class, while seasoned amateurs rode the second way – proving that teamwork is successful in the show ring and representing the bond and relationship between horse, professional and amateur. In the Country English Pleasure Pro/Am class, Sally Wheeler Maier returned to the RCPHS for the second year in a row, and also rode Captain Courageous PA. Maier is a hometown New York City resident, living just blocks away from Central Park, and was excited to return for the second annual Arabian U.S. Open. Katie Russell flew in from California with her horse Ariya Encore to compete in the Hunter Pleasure Pro/Am class at RCPHS for the first time and had a fantastic experience. Among the night’s wins, competition included three gold medals for handler Michael Byatt. Byatt held Quintessa Partners LLC’s Aria Quintessa in-hand to win the Junior Mare Halter class. He also led Quintessa Partners LLC’s Aria Qatars Angel to a win in the Senior Mare Halter class. Byatt then concluded the evening with a win holding Aria Impresario Holdings LLC’s Aria Impresario in the Senior Stallion halter class. Andrew Sellman was the handler for Mulawa Arabian Stud’s Vangelis MI to win the Junior Stallion Halter class. Natalie Jones and Anna Redmond rode Wolf Springs Ranches Inc.’s C Hondo to the gold medal in the Hunter Pleasure Pro/Am class. Rob Bick and Janie Wasilewski guided J Frank and Sara R. Chisholm’s PA Kid Khan to victory in the Western Pleasure Pro/Am class, and Joel Kiesner and Alexa Cohn rode I Ask LLC’s Afires Style to a win in the Country English Pleasure Pro/Am class. Wednesday’s competition was a beautiful display of the Arabian breed and just the start of the 2016 Rolex Central Park Horse Show. Competition continues through Sunday, September 25, with more multi-discipline equestrian sport for jumpers, dressage, and hunters. For more information, visit www.centralparkhorseshow.com. Full results from the Arabian U.S. Open are available at www.arabianhorseresults.com. Tickets are selling fast! To get yours, go to http://bit.ly/29LwkkD. Valegro arriving in New York. New York, NY – September 20, 2016 – Festivities officially got underway for the third annual Rolex Central Park Horse Show (RCPHS) on Tuesday, September 20, with the opening press conference at Wollman Rink in New York City. Reigning Olympic Dressage Gold Medalist Charlotte Dujardin (GBR) arrived to welcome international media and guests to Central Park on Tuesday, along with grand prix show jumper and inaugural RCPHS Grand Prix winner Georgina Bloomberg (USA). Mark Bellissimo, founder of International Equestrian Group (IEG) and the Rolex Central Park Horse Show, opened the gathering and greeted those in attendance. Joining Bellissimo, Dujardin, and Bloomberg were representatives from Gallop NYC and Mini Horse Heroes who spoke about how their charities benefit from the Rolex Central Park Horse Show, as well as Cynthia Richardson, President of the Arabian Horse Association. Officers from the New York City Parks Enforcement Patrol Mounted Auxiliary Unit were in the ring, Land Rover vehicles and mini vehicles were on display, and Frederik the Great: The World’s Most Handsome Horse gave a demonstration. The 2016 RCPHS begins Wednesday, September 21, and continues through Sunday, September 25, 2016, featuring multi-discipline competition and equestrian exhibitions set to the incredible backdrop of the New York City skyline. “We would like to welcome equestrian fans to New York City for what we think is a spectacular week in the world of horse sport,” Bellissimo stated. “With this backdrop, it is one of the more amazing places in the world, and we are so excited to make this one of the premier equestrian events on the world circuit. U.S. Open Dressage, presented by Axel Johnson, will be featured this week on Friday, September 23, and Saturday, September 24. In a very special appearance, Dujardin and Valegro will perform a freestyle demonstration on Saturday evening. Valegro arrived in New York courtesy of Horseflight. On Friday evening, the U.S. Dressage Team, which won the bronze medal at the 2016 Olympic Games in Rio, will be honored in a ceremony to celebrate their accomplishment. The U.S. Show Jumping Team, which earned a silver medal in Rio, will also be honored, as team members McLain Ward and Kent Farrington are set to compete. Joining the celebration as well is Phillip Dutton, who won the Individual Bronze medal in Eventing for Team USA. Also on the show jumping roster is hometown girl Georgina Bloomberg, who is one of the top riders in the U.S., and won the inaugural grand prix in Central Park in 2014. This year’s event will feature U.S. Open competition for Show Jumping, Dressage, Hunter, and Arabian disciplines, as well as a fun and educational Family Day through five days in New York City’s iconic Central Park. Tickets for Friday night are sold out, and less than 100 tickets are available for Thursday and Saturday nights! To get yours, go to http://bit.ly/29LwkkD. Jos Verlooy and Sunshine clearing 6’11” on their way to winning the Puissance at WIHS. Photo by Lauren Fisher/Jump Media. New York, NY – September 20, 2016 – The Rolex Central Park Horse Show will bring together power and speed on Thursday, September 22, at Wollman Rink in Manhattan. Dubbed “Canadian Pacific Day”, the schedule features the U.S. Open $25,000 Under 25 Hollow Creek Farm FEI Grand Prix, the U.S. Open $40,000 FEI Canadian Pacific Speed Class, and the $50,000 Engel & Völkers Puissance. “Canadian Pacific Day” begins with gates opening at 6 p.m. The U.S. Open $25,000 Under 25 Hollow Creek Farm FEI Grand Prix kicks off at 6:30 p.m. Some of the best young show jumpers in North America will compete under the lights in Wollman Rink to determine the U.S. Open champion. Following the U25 competition is the U.S. Open $40,000 FEI Canadian Pacific Speed class at 8 p.m., where international show jumpers like McLain Ward, Kent Farrington, Georgina Bloomberg, and Todd Minikus will go head to head against the clock. The fastest horse and rider combination will be awarded. The $50,000 Engel & Völkers Puissance is a new addition to the Rolex Central Park Horse Show in 2016 and will start at approximately 9 p.m. The unique event requires a special horse with power to clear a wall that is raised in height with each round. Phenom rider Jos Verlooy of Belgium, who is just 20 years old, won the $50,000 Boeing Company Puissance at last year’s Washington International Horse Show (WIHS). He will contest the Puissance and hopes to have the opportunity to set the new world outdoor puissance record, breaking the current height of seven feet, three inches. Irish rider Susan Oakes and her horse Cicero will also tackle the Puissance wall in a special addition to Thursday evening. The pair, who compete in side saddle style, will try to set a new world record as well. Oakes currently holds the world record for jumping six feet, eight inches in a puissance side saddle, and she hopes to break the seven-foot barrier on Thursday. For more information and a full schedule of events for the Rolex Central Park Horse Show, please visit www.CentralParkHorseShow.com. September 10, 2016 – New York, NY – The Rolex Central Park Horse Show (RCPHS) is pleased to welcome back top dressage riders to Wollman Rink for competition in the U.S. Open Dressage, presented by The Axel Johnson Group, on Friday, September 23, and Saturday, September 24. In a very special appearance, Olympic gold medalists Charlotte Dujardin and Valegro will perform a freestyle demonstration on Saturday evening. On Friday evening, the U.S. Dressage Team, which won the bronze medal at the 2016 Olympic Games, will be honored in a ceremony to celebrate their accomplishment. Global superstars Charlotte Dujardin OBE of Great Britain and her incredible partner Valegro will perform a freestyle test for spectators and fans of horse sport on Saturday evening. This may be the last chance to see this dynamic duo perform live together in the United States. At their home Olympic Games in London, Dujardin and Valegro captured the team and individual gold medals. This past month, they repeated their individual gold medal performance at the 2016 Olympic Games in Rio de Janeiro, Brazil, and helped Great Britain to a team silver medal. The pair has won a silver, a bronze, and five gold medals at the European Championships, won two individual gold and team silver medals at the FEI World Equestrian Games, won the FEI World Cup Finals twice, and landed the FEI World Individual Dressage Ranking number one spot. Top dressage combinations will be competing in the U.S. Open Dressage, presented by The Axel Johnson Group. On Friday at 1:30 p.m. is the U.S. Open Dressage CDI Grand Prix, and on Saturday evening is the $50,000 U.S. Open Dressage CDI Freestyle. On Friday evening during the NBC Sports Network broadcast of the $216,000 FEI Grand Prix CSI 3*, presented by Rolex, there will be a commemorative ceremony to celebrate the bronze medal achievement of the U.S. Dressage Team at the 2016 Olympic Games for team members Steffen Peters, Laura Graves, Allison Brock, and Kasey Perry-Glass, along with Chef d’Equipe Robert Dover. Dressage sponsor, The Axel Johnson Group, is well known in the dressage world through Antonia Axson Johnson, Chairman and Owner of The Axel Johnson Group, who is a long-time supporter of equestrian sport. The Axel Johnson Group is a fifth generation family business that employs more than 20,000 people around the world. Equestrian sport has been a family passion and legacy for Johnson for more than 100 years. Don’t miss seeing Charlotte Dujardin and Valegro, plus the U.S. Dressage Team and top dressage horses and riders at the Rolex Central Park Horse Show. Tickets are selling fast! To get yours, go to http://bit.ly/29LwkkD. A new addition to the program this year is the $50,000 Puissance high-jump competition on Thursday night. Photo by Sportfot. New York, NY – August 31, 2016 – The third Annual Rolex Central Park Horse Show announces an exciting line-up for show jumping fans at its event in New York City on September 21-25, 2016. U.S. Show Jumping Team Silver medalists from the Rio Olympic Games, McLain Ward and Kent Farrington, come to New York to battle for the prestigious title of U.S. Open Champion on Thursday, September 22, and Friday, September 23, 2016. They will be joined by some of the top riders in the world, including hometown hero and former Central Park Grand Prix winner Georgina Bloomberg (USA), and veteran superstar Todd Minikus (USA). A new addition to the program this year is the $50,000 Puissance on Thursday night, where leading Belgian rider and winner of the Washington International Horse Show Puissance, Jos Verlooy, will try to break the outdoor record height of 7 feet 3 inches over the big wall. He will be joined by some of the best high jumpers in the country all pushing to clear that great height. To add extra excitement to Thursday night, Irish Rider Susan Oakes and her Dublin Puissance winner Cicero will attempt the world record for side-saddle high-jump. Since its inception in 2014, the Rolex Central Park Horse Show has grown significantly to embrace a global reach and attract some of the best competitors in equestrian sport. The event, highlighted by the impressive backdrop of the New York City skyline, showcases numerous equestrian disciplines with exciting competition for the enjoyment of spectators and participants alike. For international show jumping fans, Thursday, September 22, highlights the U.S. Open $40,000 FEI Speed Class at 8:00 p.m., followed by the thrilling $50,000 Puissance high-jump competition at 9:00 p.m. Friday, September 23, features the U.S. Open $216,000 Grand Prix CSI 3*, presented by Rolex. Hunters warm up under the backdrop of the Manhattan skyline. Photo copyright Meg Banks. New York, NY – August 24, 2016 – The Rolex Central Park Horse Show will feature show hunters for the second consecutive year in one of the most spectacular horse show venues in the world. Held at Wollman Rink in Manhattan’s Central Park on September 21-25, 2016, the Rolex Central Park Horse Show welcomes some of the country’s best professional, amateur, junior, and pony hunter riders to compete on Saturday, September 24. Tickets are now on sale for this one-of-a-kind event, so CLICK HERE: http://bit.ly/29LwkkD to buy yours today! Visit www.centralparkhorseshow.com for more information. Some of the best hunter riders in the United States will return in 2016 to compete at the Rolex Central Park Horse Show in the Baxter Hill U.S. Open Hunters Duchossois Cup, also sponsored by Meralex Farm and Dr. Betsee Parker. Riders include: Liza Boyd, three-time USHJA International Hunter Derby Finals winner; Kelley Farmer, who has won more than $1.3 million in USHJA International Hunter Derby prize money; Scott Stewart, six-time World Champion Hunter Rider (WCHR) Finals winner; and Louise Serio, top rider and trainer and winner of the WCHR Finals. Additional top riders expected to attend are Hunt Tosh, John Bragg, Katie Gardner, and more. The $50,000 U.S. Open Duchossois Cup was a great success in its inaugural year. The U.S. Open winner was Jennifer Alfano of Buffalo, NY on Miss Lucy. Preceding the professional class was a $2,500 Junior/Amateur Hunter class, won by Giavanna Rinaldi of Wayne, IL on Taken. Course designer Bobby Murphy and street artist Max Collins used inspiration from New York City’s boroughs to collaborate on the design of some of the most artistic and unique jumps ever seen in the hunter ring. This year, Murphy is working with fresh, new artists to create unbelievable jumps with a “New York Pop Art” theme, including a soon-to-be-unveiled “Big Apple” jump. Gochman was “blown away” by the effort and hard work put into making the hunter classes a success at Rolex Central Park Horse Show. Gochman’s daughters, Sophie and Mimi, took first and second place in the $1,000 Pony Hunter Classic, which included a novel element where the young riders competed to a song of their choice. Although Jennifer Alfano won’t be able to repeat her performance in 2016 due to an injury, she looks back fondly at her Central Park experience and urges people to watch and support the hunter classes that take place at this historic event. Fans of equestrian sport won’t want to miss Saturday’s hunter competition at Rolex Central Park Horse Show, in addition to a full schedule of equestrian disciplines returning in 2016. Make your plans to visit the Big Apple for U.S. Open equestrian competition and see the top names in horse sport. Breeds, Central Park Horse Show, Equestrian Sport Prod. Photo provided by the Arabian Horse Association. New York, NY – The Arabian Horse Association (AHA), Aljassmiya Farm and the Rolex Central Park Horse Show (RCPHS) are proud to present the 2nd Annual Arabian U.S. Open on Wednesday evening, September 21, 2016, at the Rolex Central Park Horse Show. The Rolex Central Park Horse Show runs September 21-25, 2016, at Wollman Rink in Central Park. Arabian horses will take center stage opening night of the show. The athleticism and diversity of the breed will be shown through a variety of classes. Halter/In-Hand classes will portray these amazing horses as desirable breeding stock. Intelligence and grace will be displayed through elegant western horses, exquisite hunter horses, and mannerly country horses. Then, travel through time, where Arabian horses roamed the desert and began their journey as ancestors of modern day light breeds. The Arabian Mounted Native Costume class will take an audience on a journey, showing the magic and romance of the Arabian horse, both of yesterday, today and tomorrow. Arabian horses are the oldest pure breed of any light horse. Nomadic people of the Arabian Peninsula, the Bedouin tribes, were the first to own these light, thrifty horses. As a result, Arabians developed a strong desire for human companionship that carries forward today, along with their kind and willing attitudes and athletic stamina. Known for their finely chiseled head, dished face, long-arching neck and high tail carriage, the Arabian horse is not only athletic and kind, but also beautiful. Mark Bellissimo, CEO of International Equestrian Group, is pleased to welcome the Arabian horse Association to Central Park for their second year and looks forward to the event. Watch these amazing horses compete and earn their gold, silver and bronze titles at an event that can’t be missed. Tickets are on sale now at cphs.coth.com. Launched in September 2014, Rolex Central Park Horse Show is the first-ever outdoor, multi-day equestrian sporting event in New York City, showcasing some of the best show jumpers and dressage riders in the world as they vie for top prizes against a backdrop of skyscrapers in one of the world’s most iconic venues. As the event founder, Mark Bellissimo is the CEO of Equestrian Sport Productions and International Equestrian Group LLC; Managing Partner of Wellington Equestrian Partners (WEF), Tryon Equestrian Partners and Colorado Equestrian Partners; and Publisher of The Chronicle of The Horse magazine. 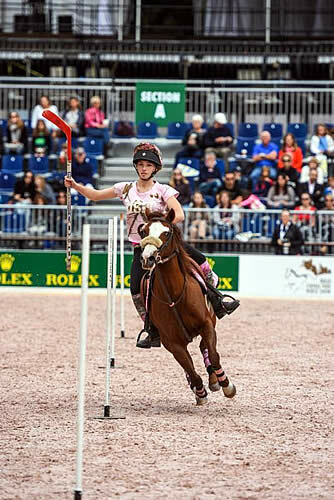 The Rolex Central Park Horse Show will feature five days of multi-discipline equestrian sport and performances, ranging from Arabians and Dressage to Hunters and Show Jumping. The Rolex Central Park Horse Show will also host the second annual U.S. Open in the following categories: Jumpers; Dressage; Hunters; U25 Jumpers; and Arabians. For more information, visit www.centralparkhorseshow.com or Facebook at www.facebook.com/CPhorseshow. The 2015 Rolex Central Park Horse Show. ©MegBanks/ESP. New York, NY – June 8, 2016 – Want to jump to new heights in the Big Apple? The 2016 Rolex Central Park Horse Show, one of the most highly anticipated equestrian events of the year, is seeking interest from competitors for a potential $50,000 Puissance class to be hosted in the iconic Wollman Rink on Thursday, September 22. An additional $50,000 Rider Bonus will be offered to the combination who can break the international outdoor Puissance record. The 2016 Rolex Central Park Horse Show will begin on Wednesday, September 21, and continue through Sunday, September 25, featuring U.S. Open competition for Show Jumping, Dressage, Hunter, and Arabian disciplines. The Puissance is a special opportunity for riders to compete in Central Park and be a part of the Rolex Central Park Horse Show. A favorite class with spectators for its entertaining and electric atmosphere, the Puissance starts with a wall set at 4 feet, 6 inches high. As horses clear it, the wall is raised, and the thrilling competition continues with each round, showcasing the versatility and athleticism of the horse. Fans hold their breath to see who can clear the towering jump as horses gallop down to the wall. The Rolex Central Park Horse Show has amassed a significant global media presence since its inception in 2014 and is highlighted by the impressive backdrop of the New York City skyline. The event showcases numerous equestrian disciplines, while the addition of specialty competition opportunities this year will bring an intriguing element of excitement for spectators and participants. Those interested in participating in the $50,000 Puissance class at The 2016 Rolex Central Park Horse Show, please contact Michael Stone at mstone2811@gmail.com. For more information on The 2016 Rolex Central Park Horse Show, please visit www.centralparkhorseshow.com. Charlotte Dujardin, aboard Renaissance Tyme, and Robert Dover during Sunday’s Master’s Class. Photo by Josh Walker for The Chronicle of the Horse. New York, NY – The second annual Rolex Central Park Horse Show wrapped with a day of equestrian demonstrations and family-friendly fun on Sunday. Number-one dressage rider in the world Charlotte Dujardin took to Wollman Rink aboard Evi Strasser’s Renaissance Tyme, along with Olympian and United States Dressage Federation Hall of Fame Member Robert Dover, for a Master’s Class, presented by The Chronicle of the Horse and Breyer. Dujardin guided spectators and viewers tuning in via live stream through her process of warming up, schooling and cooling down her horses with commentary from herself and Dover. Dujardin had only sat on Renaissance Tyme, a 12-year-old German-bred Oldenburg gelding, twice before Sunday’s exhibition, including a performance in Saturday night’s U.S. Open $75,000 Dressage Freestyle, presented by Axel Johnson Group, at the Rolex Central Park Horse Show. While Dujardin boasts Olympic, FEI World Equestrian Games and European Championship gold medals to her credit, her message to spectators was focused on the well-being of her horse, as well as establishing a solid foundation for success. Preceding Dujardin’s Master’s Class, horse-sport fans of New York City and beyond were welcomed into Central Park for admission-free demonstrations, including a versatility exhibition of the Arabian Horse, United States Pony Club mounted games, a show jumping clinic with Candice King, and the Land Rover Mini-Car Driving Experience. The Rolex Central Park Horse Show concluded Sunday, September 27, but the excitement isn’t over yet. Coverage of Friday night’s $212,000 U.S. Open CSI 3* Grand Prix, presented by Rolex, will air tonight, Sunday, September 27, 2015, on NBC Sports Network from 9:00 – 10:30 p.m. EST. Show managers are already making plans for the return of the Rolex Central Park Horse Show in 2016 with more competition showcasing varying disciplines of horse sport in the heart of New York City’s iconic Central Park. Launched in September 2014, Rolex Central Park Horse Show is the first-ever outdoor, multi-day equestrian sporting event in New York City, showcasing some of the best show jumpers and dressage riders in the world as they vie for top prizes against a backdrop of skyscrapers in one of the world’s most iconic venues. As the event founder, Mark Bellissimo is the CEO of Equestrian Sport Productions and International Equestrian Group LLC; Managing Partner of Wellington Equestrian Partners (WEF), Tryon Equestrian Partners and Colorado Equestrian Partners; and Publisher of The Chronicle of The Horse magazine. In its second year, Rolex Central Park Horse Show will make its triumphant return from September 23 to 27, 2015 and will feature five days of multi-discipline equestrian sport and performances, ranging from Arabians and Dressage to Hunters and Show Jumping. The Rolex Central Park Horse Show will also host the inaugural U.S. Open in the following categories: Jumpers, Dressage, Hunters, U25 Jumpers, and Arabians. For more information, visit http://centralparkhorseshow.com, on Facebook at https://www.facebook.com/CPhorseshow, and follow @cphorseshow on Twitter and Instagram.